Creating a new funnel is pretty easy, but it requires following a few steps and not leaving any of them out. What’s the point of creating a funnel to examine a conversion process if you skip over a step or two, focusing only on those steps you deem “important”. You’ll never know which steps turn out to be most vital to your conversion process until you test it out. So don’t gloss over the “less important” (as you might think) steps. To create a new funnel, you have to start at your Piwik PRO dashboard. There you’ll find the Goals menu, which you have to click on, and then choose the Manage Goals section. In the Manage Goals section you have two options: to add or to edit a goal. To create your funnel you need to first create a new goal. After if has been created, you can edit it, thus creating a funnel. While editing simply click the Add Step button in your goal. Add as many steps as you need, specifying their name and match type. It’s important to remember that not every step you add has to be completed for the goal to be converted. Think about it – there are many ways to reach the same destination. So you can check some steps as required, deciding on the necessary steps and optional ones for your conversions process. This option could be very useful if you want to test additional steps which you’re adding to your conversion process, but you already had one established. On the other hand, checking a step as required means that for visitors who didn’t complete the step a goal won’t be tracked. 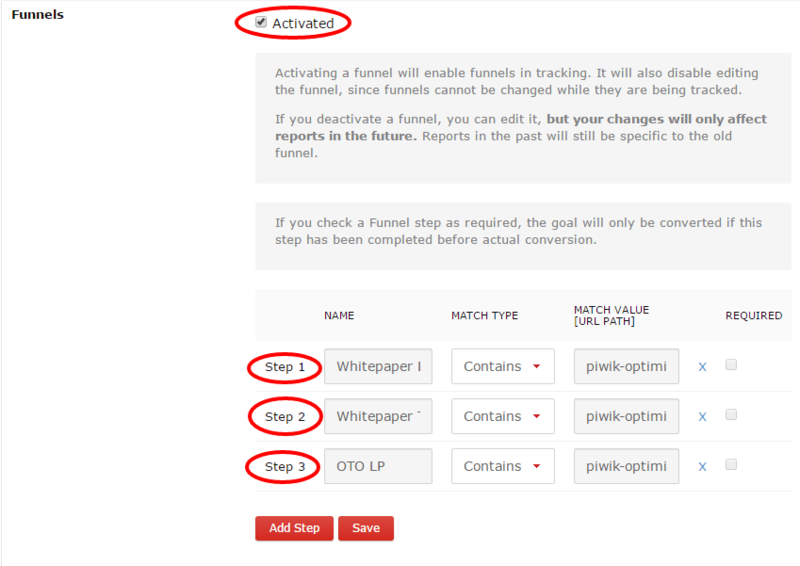 After adding all steps and making sure they are set correctly, check the box “Activated”, hit “Save” button and that’s it – you’ve just created a funnel. Helpful tip: Nowadays most funnels are not linear paths, and most steps are optional. Big websites tend to create countless possibilities for considering multiple scenarios. In most cases, there will be no more than 3 required steps in your funnel. Keep that in mind.